This is a simple currency conversion program. The program allows you to convert from USD amount to Riel amount and vise versa and from EURO amount to USD amount and vise versa. In this program, you will learn to use the JTabbedPane class, and JComboBox lass, and to write Java code to detect key typed. 1 Set the title of the program window (Currency Conversion Program). 2 Let the program window close when the user clicks the close button. 3 Specify the width and height of the program window when it opens. 4 Disable program window resizing. 6-27 Construct the interface for USD and Riel conversion. We need three labels, one combobox, two text boxes, and one button. These controls are grouped together in the panelt1 object. The combobox allows the user to select conversion rate. The text boxes are for inputting USD or Riel amount. Inputting in both text boxes in one operation is not valid. If you input USD, the conversion will be made from USD currency to Riel currency and vise versa. The two text boxed are registered to the key event so that restriction can be placed on its key typed. The button object is registered to the action event to enable button-click action. 28-49 The construction of the interface for EURO and USD conversion is done in the same way as the interface for USD and Riel conversion except different names of controls. 50 Create a JTabbedPane object tbpane. 51 Place the panelt1 to the first tab. 52 Place the panelt2 tot the second tab. 53 Set title of the first tab to "USD and Riel " text. 54 Set title of the second tab to "EURO and USD" text. 55 Add the tbpane oject to the container. 56 Make user the program window is visible. 57 The actionPerformed method is rewritten to enable the button-click action. When the user clicks btuskh from the first tab, the conversion is made from USD amount to Riel amount or vise versa. 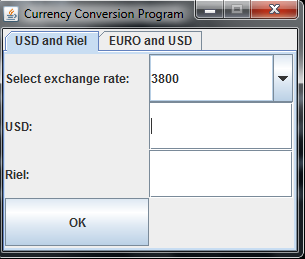 If you want to convert from USD to Riel , input the USA amount and leave the Riel text box blank and vise versa. If the user clicks the bteurous button from the second tab, the conversion is for EURO to USA currency. It works the same way as the previous button click except for different currencies conversion. 58 The KeyList class extends the KeyAdapter class to rewrite the keyTyped method. This method defines code to restrict key typed in all text boxes. Only number, dot, backspace, and delete keys are accepted. 59 The checkBlank method is implemented to check whether the combobox conversion rate or the two text boxes are not blank before conversion can be made. 60 The usdToKH method is invoked to convert from USD amount to Riel amount. 61 The khToUSD method is invoked to convert from Riel amount to USD amount. 62 The euroToUSD method is invoked to convert from EURO amount to USD amount. 63 The usdToEURO method is invoked to convert from USD amount to EURO amount. 65 The showMessage method is invoked to show a message dialog to inform the user when an invalid action is being made. 66 The CurrencyConversion Program has the main method to start the program. Hello Sir/Maam....how can i add this code to your QuizProgram? please help me...thank you so much.